First the bad news -- I foolishly didn’t reserve enough yardage for the project! When I originally set aside the Washington Square fabric, I knew I wanted to make a cardigan but I didn’t know I wanted a long one. This cardi will end up being around 25 inches which is about 3 inches shorter than what I imagined when I did my idea sketch. The fabric has lots of horizontal stretch. My issue is only with the length, not the width. 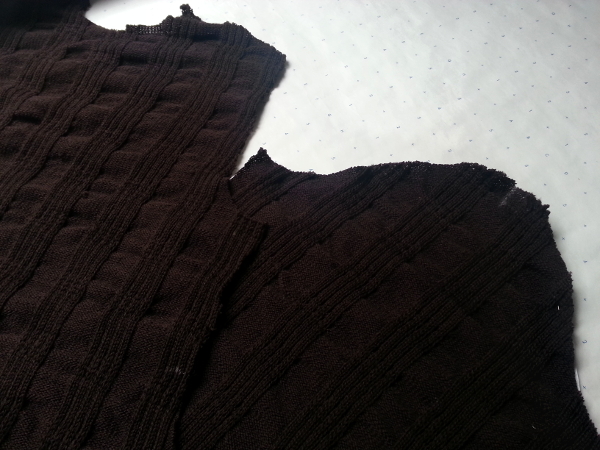 To preserve length for the body of the cardigan, I've cut what would have been the funnel neckline separately. The cardigan will now sport a mock turtleneck. I'm quite pleased with some other changes. I was able to find a brass separating zipper in a pretty brown. This led me to change my embellishment threads to multiple shades of brown and gold. I may now look for warm brown leather for trim instead of the black leather I was originally considering. I decided to use the finished measurements of the Rippled Zipper jacket as a starting point, since I like the way the jacket fits. The Rip Zip fabric has more body than my current fabric, so I assume the finished look will be a little different. The Washington Square sweater knit is dark so I wasn’t able to use my favorite felt tip marking pens, which only work well on medium- and light-colored fabrics. I used a white Clover Chaco Liner instead. It's not bad, but it doesn't give as much control as a felt marker on this type of fabric. I got carried away and made my marks much too thick at the waist and sleeve cap. I wanted to be sure I could see them. Ha! You’ll notice that I did not cut separate pieces for the front of the cardigan. I decided it would be best to stabilize that area before cutting since I’ll need to stabilize anyway for the zipper. By delaying the cut I can make sure the textured design of the sweater knit will match. Of course this trick only works with an exposed zipper closing or other closing design where the front cardigan pieces aren’t meant to overlap. It wouldn’t work with a lapped zipper, for example, which would require extra fabric. Cutting this way, however, may work when there’s an extra piece in the front, as in a cardi with shawl collar or button band. 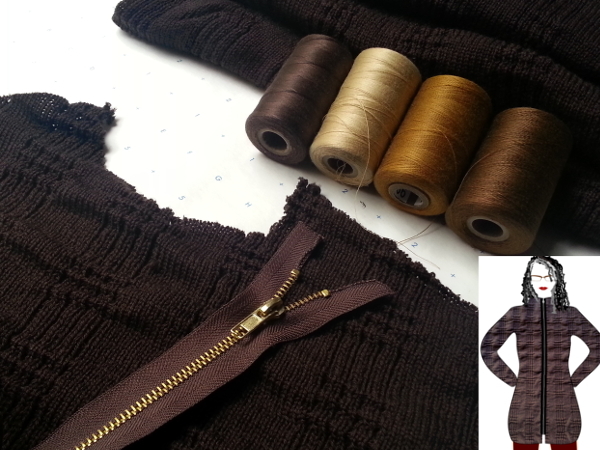 I would also use this method to turn a pullover into a cardigan.